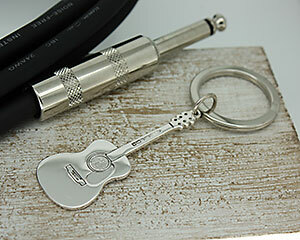 A fantastic gift for any music lover this acoustic guitar key ring is a must, we can personalise it on the back for you. The hand finished and hall marked sterling silver acoustic guitar keyring is a great gift for Daddy, Mammy, brothers or sisters or simply any one with a love of keys, musical keys of course. Each silver keyring is hallmarked here in Birmingham to show off its sterling silver pedigree and lovingly polished to a high lustre. We can personalise the acoustic guitar keyring for you in a choice of two fonts for free.